New York, New York – (August 1, 2016)– The New York International Salsa Congress (#NYISC2016), a multi-day Latin music and dance festival, celebrates its 16th anniversary with over 8,000 attendees from around the world at The New York Marriott Marquis in Times Square from Thursday, September 1, 2016 to Sunday, September 4, 2016 with an official kick-off party held at Haus NYC in Tribeca on Wednesday, August 31, 2016, presented by Goya Foods and sponsored by Festival People en Español. 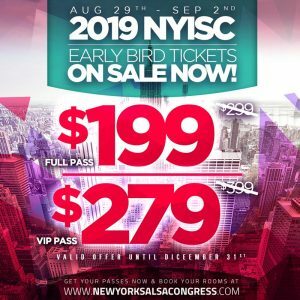 Attendees will have the opportunity to choose from over 60 instructional dance workshops, view a fantastic showcase of professional dance performances and competitions, and dance all night to a LIVE concert series with Jimmy Bosch and vocals by soneroHermán Olivera “El Sonero del Siglo XXI” (Friday, September 2), Fania legend ADALBERTO SANTIAGO Pagina Oficial (Saturday, September 3), and the one and only Roberto Roena Pagina Oficial (Sunday, September 4). Opening night Thursday, September 1 theme “Remembering the Greats” featuring a tribute to salsa legends with special guest invitees including friends and family members.